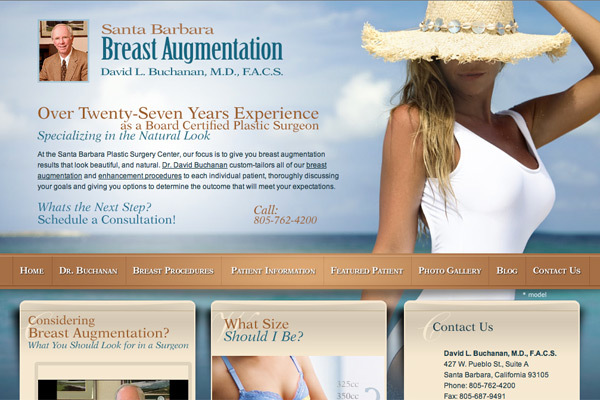 Dr. David Buchanan’s new website focusing on breast augmentation in Santa Barbara, utilizes a range of the most advanced website design tools to create an extensive educational network specifically geared toward breast surgery. As Dr. Buchanan and his experienced staff take great pride in providing the information and support necessary to make patients feel comfortable with their aesthetic enhancement decisions, creating a website that facilitated a similar feeling was important to him. In cooperation with the medical website design team of graphic artists and writers at Rosemont Media™, Dr. Buchanan’s website incorporates easily-accessible, fully-optimized content, while providing detailed descriptions of all plastic surgery procedures he offers in easy-to-navigate drop down menus.